Editor’s Note: I would like to thank Melissa Mastronardi, the great great granddaughter of Cornelius Houghtaling, for granting me written permission to publish her ancestor’s letter. This letter, including the images and the transcription, are owned by Melissa’s mother Diane Newman Mastronardi and may not be reproduced without her written permission. All rights reserved. Brothers Cornelius and William Houghtaling, the sender and recipient of the letter linked below, respectively. Descendants are unsure which brother is which. I was pleasantly surprised to receive an email from Melissa Mastronardi about a letter in her possession. It was written by her great great grandfather Cornelius Houghtaling [or Hotaling, the spelling differs in the letter and in various records of the brothers’ military service], a member of the 13th New York Heavy Artillery, Company H, on August 18, 1864 to his brother William. Cornelius was stationed at Fort Carpenter, a Union work in Benjamin Butler’s Bermuda Hundred lines, not too far from Dutch Gap. 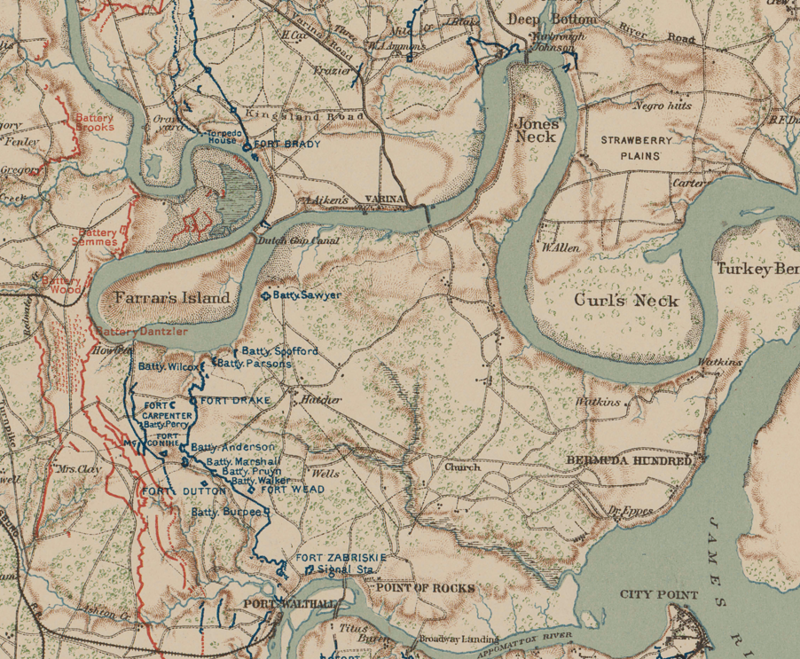 In mid-August 1864, the Army of the James was attempting to cut a canal through Dutch Gap to bypass the Confederate fortifications at Drewry’s Bluff. Houghtaling’s letter to his brother discusses some of the action in the area during this time frame. I have a letter written by my gggrandfather to his brother on 8/18/1864 concerning the Siege of Peterburg. My great great grandfather served twice. I will get you the military records of both of his services, first in the 18th New York Infantry and then in the 13th New York Heavy Artillery. We have a picture of two men and we know one of them is him and his brother. Unfortunately we dont know which is which. 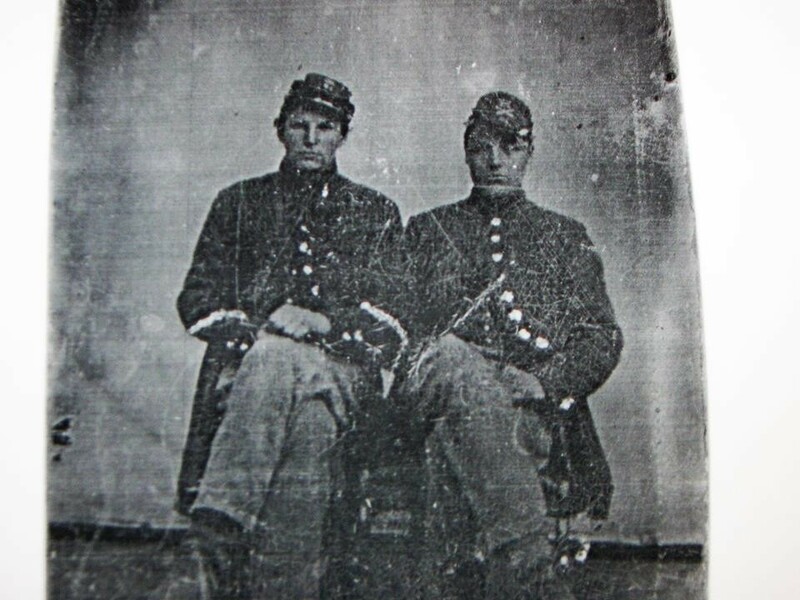 Tintype photos that were taken out of an album are hard to identify later. I and [author of a book on the 18th New York Infantry] Ryan Conklin have transcribed most of the letter but we have a few minor differences in some words. My GG Grandfather also has 2 stories about him in Ryan Conklin’s book The 18th New York Infantry in the Civil War: A History and Roster. I have been told he was the youngest recruit from New York..He was 14 but said he was 18 It has been repeated many times but I have never verified this. He was one of the children soldiers and served throughout the war. Cornelius married Mary “Monhollin” on December 24,1865. The correct spelling was Mulholland. A map of the Bermuda Hundred and Dutch Gap area appears below so you can see for yourself where this soldier was writing from and about. A copy of the cover sheet of his pension application also appears below. Cornelius Houghtaling wrote his letter from Fort Carpenter, near the northern end of the Union lines on Bermuda Hundred. Dutch Gap is to the northeast. 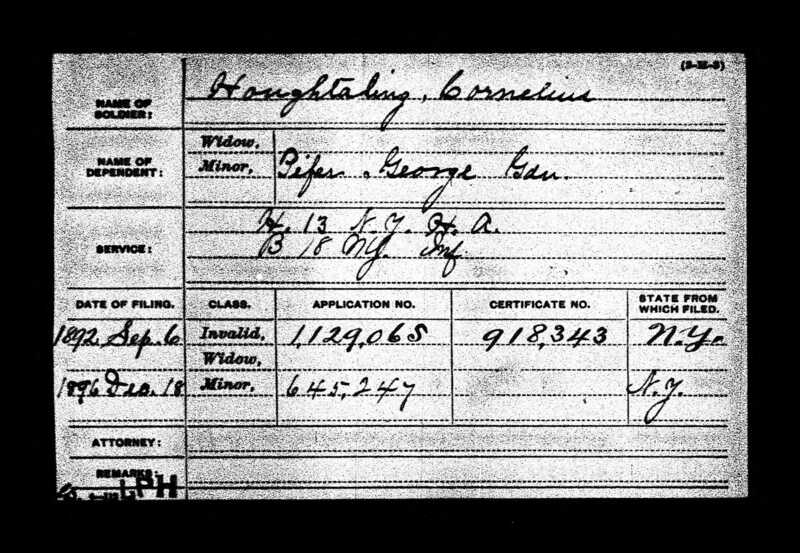 Part of the pension file of Cornelius Houghtaling, showing he was a member of the 18th NY Infantry as well as the 13th NY Heavy Artillery at various points in the war. 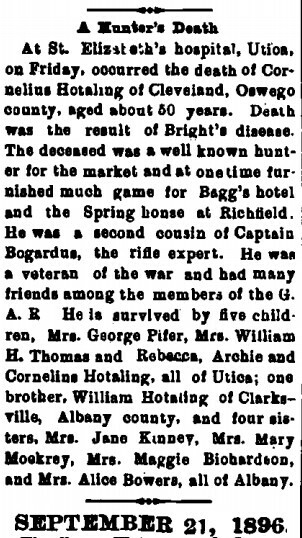 Cornelius Houghtaling passed away on Setember 18, 1896 from “an attack of Bright’s disease.” Melissa was kind enough to pass along not one but two obituaries of her ancestor. 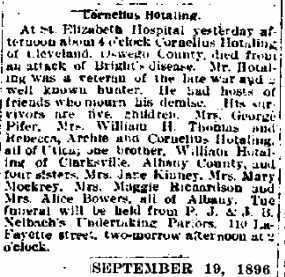 Careful readers will note that his brother William, the recipient of his August 18, 1864 letter, was still alive at the time of Cornelius’ passing.